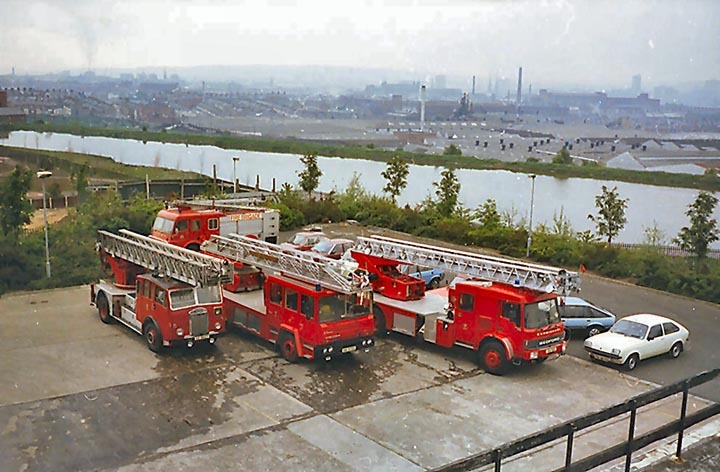 I took this picture C1985 in Springfield Fire Station, Belfast, N.I. From left to right - Dennis Metz, Shelvoke Merryweather (re-chassised from an AEC ) and a Bedford Magirus. The WRL in the background is a Dodge. I have a couple more of these three appliances taken from slightly different aspects; if you think they'd be suitable I'll gladly add them to the site. Murray you have probably seen the recent discussions about OZ9607, PDK717 and the Auckland 125' Dennis Metz. Added by Barry. on 07 March 2007. Yes mate, love to see the TL photos. This is a great shot!! Added by Fire995 on 07 March 2007.
two questions: which of 383tz and 8100gz donated the ladder to the shelvoke and do you know the reg of the dodge? Added by Martin on 11 April 2007. Added by Murray Armstrong on 12 April 2007.